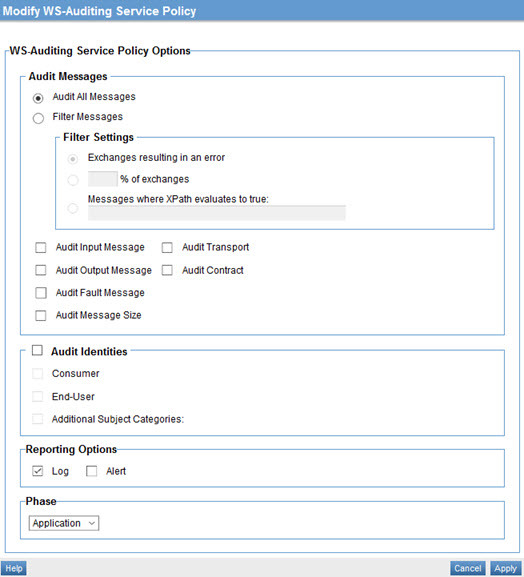 Learn about the WS-Auditing Service policy and policy configuration options. You can attach the WS-Auditing Service policy to Services, Bindings, Operations, and Access Points. In the second panel, click Modify to access the Modify WS-Auditing Service Policy page, as shown below. Specify values. For information about the fields, refer to WS-Auditing Service policy options below. Audit All Messages: Enables the auditing of all messages. Messages where XPath evaluates to true: Enables the ability to audit messages that satisfy a specified XPath. This option includes a table where you can define Prefix and Namespace for each XPath expression. Click Add or Delete to modify the list. You can also sort the list by clicking the table header. Audit Input Message: Enables the auditing of input messages. Audit Output Message: Enables the auditing of input messages. Audit Fault Message: Enables the auditing of fault messages. Audit Message Size: Enables the auditing of the size of messages in the exchange. Audit Transport: Enables the auditing of transport information. Audit Contract: Enables the auditing of a contract governing a message. Consumer: Audits the consumer identity sent with a request message. Log: Check the box if the audit information must be logged. Alert: Check the box if the audit information must be delivered in an event. Application: Option that enable auditing of message content in its application readable format. Wire: Option that enables auditing of message content in its wire format. Modify: A link that launches the "Modify WS-Auditing Service Policy" screen. Audit Message Size: Indicates whether size of messages in the exchange should be audited. Messages Filter: A read-only label that indicates the type of filter being applied to messages. Audit Input Message: Indicates whether Input Message content is being audited. Audit Output Message: Indicates whether Output Message content is being audited. Audit Fault Message: Indicates whether Fault Message content is being audited. Audit Contract: Indicates whether the contract governing the message is being audited. Audit Transport: Indicates whether transport headers are being audited. Audited Identities: Indicates whether the identities (by Subject Category) in the message are being audited. Log: Indicates whether audit information is being logged. Alert: Indicates whether audit information is being delivered in an event. Phase: A read-only label that indicates the phase of message processing (Application or Wire) when auditing occurs.